A Massey University researcher is seeking participants for a study into whether soy isoflavones and kiwifruit help improve bone health in post-menopausal women. Professor Marlena Kruger, from the Institute of Food Nutrition and Human Health, was awarded $500,000 in funding by the Ministry of Science and Innovation and the Japan Science and Technology Agency for a research program of which the study forms part. Professor Kruger says post-menopausal women over 50 are vulnerable to osteoporosis because of the estrogen loss during menopause. "Estrogen replacement therapy is effective at maintaining bone health, but there is research that shows it may have undesirable side effects and even cause breast cancer," she says. Some plants, including soybeans, produce phytoestrogens - estrogen-like molecules - that may be an alternative to the standard replacement therapy. "Isoflavones, which are the most studied phytoestrogens related to bone health, have been shown in studies of older Asian women to be protective against fractures," she says. "However, to be effective one of the isoflavones, Diazein, needs to be broken down in the intestines and Caucasian women do not seem to be able to do this as well as Asian women." 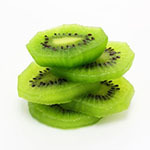 There is evidence that by changing gut bacteria with natural foods - in this case green kiwifruit - the digestion of the isoflavones can be improved. Professor Kruger is now seeking participants from the Manawatu region for a 16-week trial. "We need 60 female post-menopausal women for the study, who will take tablets of soy isoflavones with or without kiwifruit." Samples of blood and urine will be taken and tested as part of the study. Similar trials have been done by partner researchers in Japan. Professor Kruger then hopes to develop products in conjunction with New Zealand food manufacturers that can curb osteoporosis by combining phytoestrogens with other active ingredients in functional foods. Figures from the International Osteoporosis Foundation show in New Zealand there were an estimated 84,000 osteoporotic fractures in 2007, with 60 per cent of these occurring in women. The total cost of osteoporosis in New Zealand is estimated to be more than $1.15 billion per year, and it is estimated that both the number of osteoporotic fractures and the cost of healthcare associated with osteoporosis will increase by more than 30 per cent between 2007-2020.